Located in Croesor, in the Snowdonia National Park between Cnicht (a popular mountain for climbers and walkers) and the Moelwyn range of mountains. The seaside at Morfa Bwchan is a short drive away. Living room equiped with open fire and 3 storage heaters, double sofa, 2 armchairs, television and video, table and 4 chairs, kitchen area with cooker, microwave, electric kettle and toaster, washing machine and dishwasher. Upstairs double bedroom, small bedroom with 2 bunk beds and bathroom with immersion heater heated overnight. Down stairs there is another bedroom with a small double bed and TV. Enclosed front garden with wooden bench overlooking the croesor valley and the moelwyn mountain range. The cottage situated in Croesor, near Porthmadog is well equiped for any family holiday and has been let for over 30 years. The property is available for rental all year found, and is a great location for walking to beddgelert through the world famous aberglasslyn pass, the pyramid shaped mount cincht and the moelyn mountains. Located near Clough Williams-Ellis home of Plas Brondanw (gardens open to visitors) the architect whom designed Portmeirion which is located only 10 miles from the cottage, across the dam from Porthmadog. The cottage is surrounded by some of Wales most beautiful mountains and is also ideally situated to see castles, historic gardens and beaches. A great location for couples and families. The Bathroom is located on the first floor. Two lazy boy chairs and a sofa are available so you can put your feet up after a long walk. Dogs must be kept down stairs and out of the bedrooms. Facilities include Sky TV. There is now a drive at the front of the property with space for one car. Additional cars can be parked at the snowdonia national park car park 200m away. Wifi is now available at the property. Guests must provide their own linen and towels. We had a wonderfully relaxing 4 night stay in this beautiful location. The cottage had everything we needed and more. We will stay there again! Cosy cottage with everything we needed for a mid winter short break. Didn’t receive arrival info until we were there and a bit disappointed that the cottage obviously hadn’t been cleaned prior to our arrival with the previous guests dirty linen & towels still there. We enjoyed exploring the surrounding area and our dog loved Morfa Bychan beach. The final details arrived in my email box on the day I left so I missed them. I could have done with them before that. I have just read them now on my return.The cottage location is wonderful for local walks and also ideal for getting about the rest of Snowdonia. There was a stain on the new looking mattress protector which affected my entire feeling about the place. This was probably an oversight. I would go again for the location and I was very warm and lacked for nothing. Thank you for your feedback. I am sorry things weren't as good as they could have been. The cottage letter should have been sent to you 42 days before your arrival automatically and then a reminder before your stay. I will check the settings to see what has happened. Wonderful stay in a simply stunning location in a homely and warm cottage. Fantastic stay in a simply stunning location in a homely and warm cottage. This is a lovely cosy cottage in a beautiful situation. It is surprisingly and generously well equipped for its size and had everything our family of 4 needed for the week (and we loved the reclining sofas!). 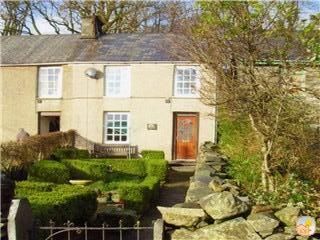 There are a multitude of walks from the house which could keep you busy for days with no need for driving anywhere but the cottage is also well situated for places like Coed Y Brenin, Bounce Below etc. Although the garden area is small our boys were delighted to find a small football pitch in the village, that was an unexpected and welcome bonus! We definitely hope to return soon. Amazing location, lovely cottage, everything you need. Wonderful stay, lovely views, warm fire, great walks, wish we stayed 2 weeks! Croesor is the starting point for climbing Cnicht, a pyramid shaped mountain, and the Moelwyn mountain range. Sarn Helen, a Roman road, goes north west to Beddgelert through Nantmor and the Aberglaslyn Pass, and south east over the shoulder of the Moelwyns to Tan-y-Bwlch and the narrow gauge Ffestiniog Railway, with steam trains to Porthmadog and Blaenau Ffestiniog. The garden at Plas Brondanw (less than 2 miles away) is open to the public; this was the home of Clough Williams-Ellis, the architect of Port Merion, which is 5 miles away. A short drive away are the beach at Morfa Bwchan (Black Roack Sands), castles including Criccieth, Harlech and Caernarfon, slate quarries at Blaenau Ffestiniog, a copper mine near Beddgelert and many other attractions. Minimum charge of half the weekly rate or £120 (whichever is greater) applies for up to 3 nights. Extra nights available. Bookings are reserved once we have received the deposit, the balance is due six weeks before the start of the holiday. Departure by 10 a.m. Arrival from 5 p.m. Changeover is Saturday. Please contact for other days. Up to two well behaved dogs, must be kept down stairs.